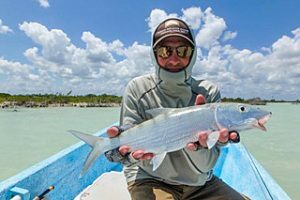 “WorldCast Anglers reserved a peak week at La Pescadora Lodge, just south of Punta Allen, Mexico this past spring, and it was an excellent week. We were a group of 5 anglers, mostly new to salt water with one of our group highly traveled and experienced in the salt. We had two guys from Michigan, two from Idaho, and one from Washington State. We were all pleased to leave cold, snowy, rainy spring behind and land in sunny Mexico. All our travel went smoothly and we all rendezvoused in Cancun for Friday night and were transferred by private van the next morning to Tulum. We had an excellent beachfront lunch of fish tacos in Tulum and then met our private panga at the entrance dock to the Sian Ka’an Biosphere Reserve, a UNESCO world heritage marine biological preserve. The day was sunny with a light breeze. The boat transfer to Punta Allen was smooth, the water was crystal clear, we saw sea turtles, birds and other wildlife on the ride. We were met by Pepe in Punta Allen who helped with all our bags and gear and drove us a short distance to La Pescadora Lodge at the end of the road, near the Ascension Bay lighthouse. 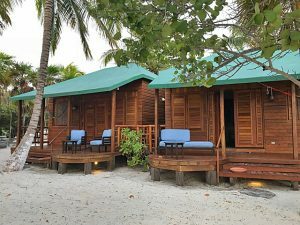 Once we arrived at La Pescadora we were shown our rooms, given a brief orientation, itinerary of our week and each day at the lodge. We were able to settle in and relax. 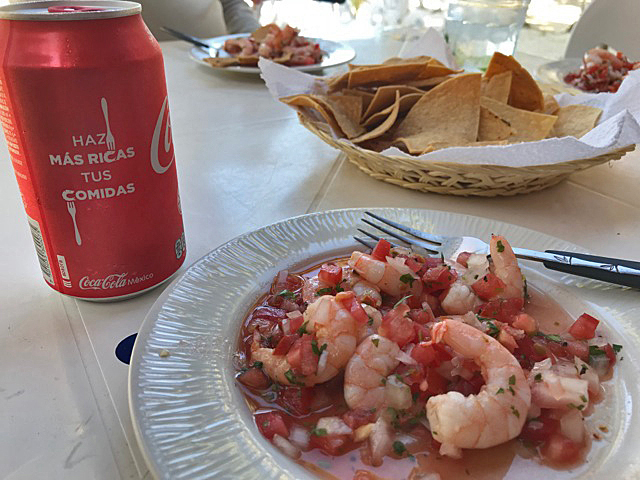 Pepe offered refreshments of cold cervezas, a margarita, and I had a nice fresh blend of fresh squeezed orange and pineapple juice. Then we rigged our rods; 8 weights for bonefish, 9 weights for permit, and 10 weights for tarpon (also permit shots in the wind) in preparation for 6 days of world-class flats fishing in Ascension Bay. We finished with an authentic and excellent Mexican dinner inspired by Mayan recipes, with fresh local, tropical ingredients. We all loved the hand made tortillas and habanero salsa that was offered with every meal. The rooms are spacious, well appointed, with private bathrooms and air conditioning. The next 6 days were fantastic. We had great sun and relatively light winds; of course the wind always seems to be in your face when you see a nice fish. Over the course of the next 6 days, our 4 guides: Jose, Nestor, Daniel, and Rodo along with their junior guides always arrived early with clean boats. We would have coffee at 6:30, breakfast a 7:00, and be in the boats running to the flats usually just before 8:00 am. 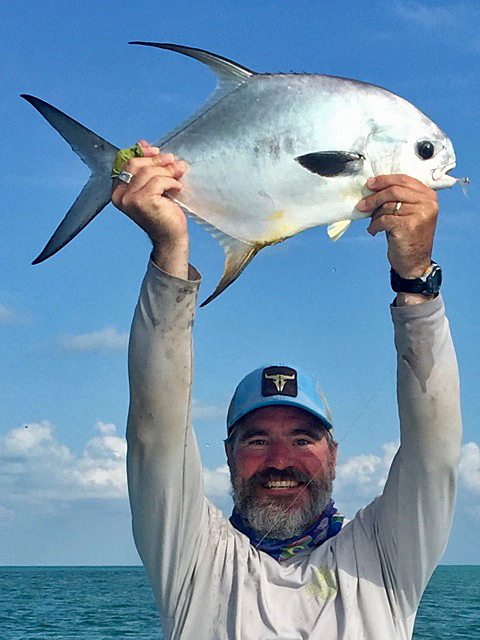 Over the course of the week, all five anglers had a permit eat their fly. Three of our group landed permit and the most experienced of our group landed multiple permit during our stay. We also targeted bonefish, tarpon, snook and barracuda. 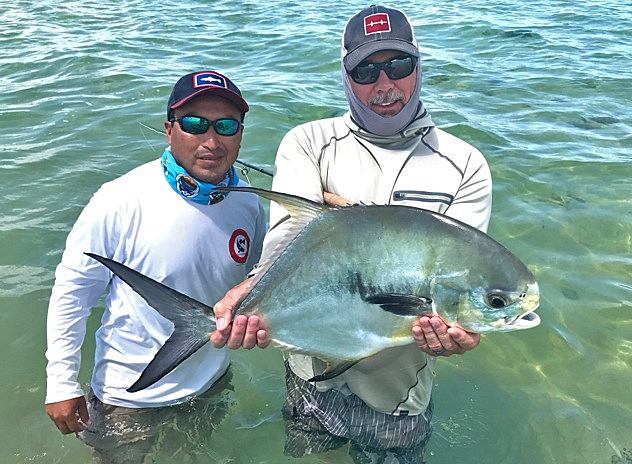 We were successful with all species and even had fun with some hard-fighting jacks (affectionately referred to as Mayan permit). I loved the jack fishing because they fight, run, pull and bend the heck out of your rod – and eat your fly with reckless abandon. Jose Ucan and Lily Bertram truly run a high caliber, attractive, comfortable lodge with excellent food and tremendous guides. The staff and crew worked extremely hard to make our stay the best as possible, and it exceeded all our expectations. The fishing was excellent, but perhaps the experience we will all remember the most, was the evening of Lily’s birthday party. It seemed as if most of Punta Allen celebrated Lily’s birthday. It was a feast, with laughter, singing, presents and pranks. Lily has an interesting story. She is originally from North Carolina, went to UNC, attended Spanish language immersion school in Mexico, made her way to the Yucatan, and eventually married Jose. Jose is from a highly respected multi-generational fishing family in Punta Allen. At her birthday party you got a real sense of how much Lily, Jose, their two sons and La Pescadora mean to the local community. Jose and Lily have an exceptional salt water flats fishing program and I hope to return next season.